In the vast majority of legal systems, judicial review has become the principal mechanism through which most constitutional debates are eventually settled or at least receive some form of resolution. However, the terms of our national constitutions seldom provide for how the courts are to scrutinize the laws challenged before them. In Canada, the modern practice of judicial review is the result of a succession of momentous events and piecemeal developments spread over the past few centuries, some of which have occurred in other countries with a common law-based system. 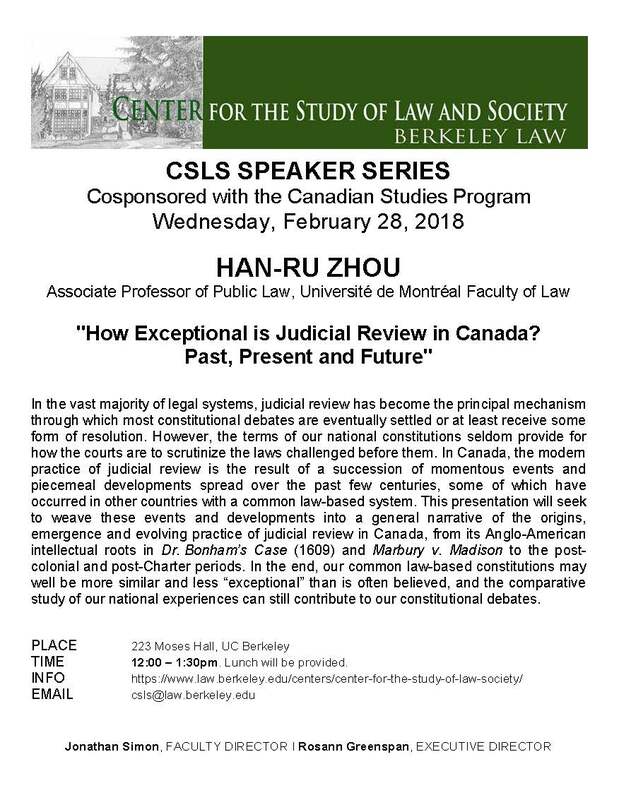 This presentation will seek to weave these events and developments into a general narrative of the origins, emergence and evolving practice of judicial review in Canada, from its Anglo-American intellectual roots in Dr Bonham’s Case and Marbury v Madison to the post-colonial and post-Charter periods. In the end, our common law-based constitutions may well be more similar and less “exceptional” than is often believed, and the comparative study of our national experiences can still contribute to our constitutional debates. Ce contenu a été mis à jour le 22 décembre 2018 à 17 h 54 min.